Romina here claims that this was worn for an 80's themed day at school, but you and I know she's fibbing don't we? Look at the tell-tale signs: 2nd hand tails, hair draped over the eyes, too many necklaces - the similarity to Molly Ringwald and Ducky is unmistakable. 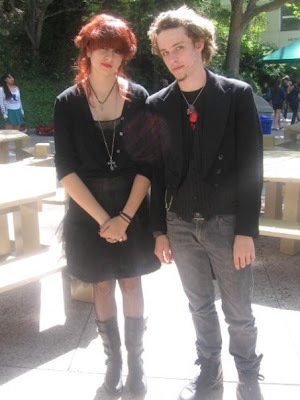 Two Goths - Spotted! this was my old high school!